I’ve been really delinquent on new reviews, sorry. I was back in California for most of July, but I’m now back in Taipei. I have heard a lot about Kiki over the past year from several friends, but never had the time to go. So when my friend Will asked if I wanted to go I was excited to finally try it out. 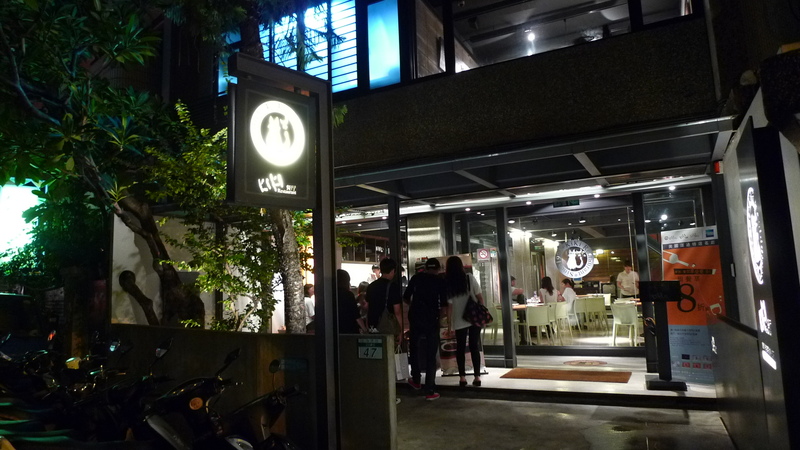 Kiki has three locations in Taipei, one in Taizhong, as well as a Thai restaurant (Kiki Thai Cafe) and a cafe (Kiki Cafe), both in Taipei. 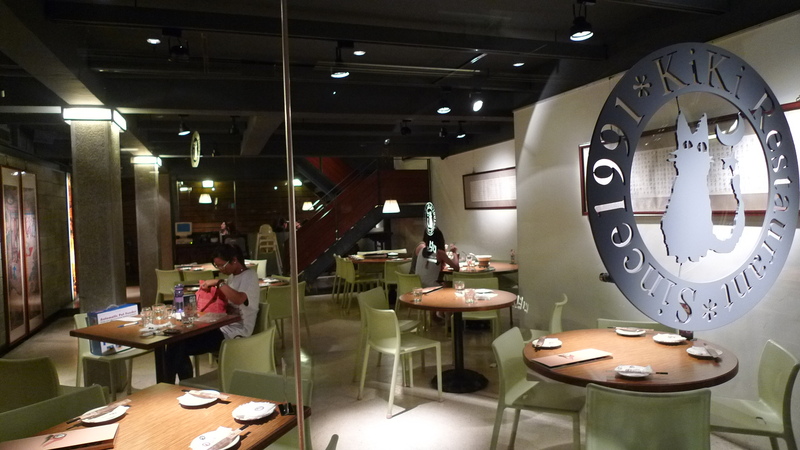 We ended up at the Yanji store (延吉店), which is located near Sun Yat-Sen Memorial Hall (國父紀念館). My friend made reservations for 8pm on a Thursday night. When I asked why so late, he said it was because it was all they had. 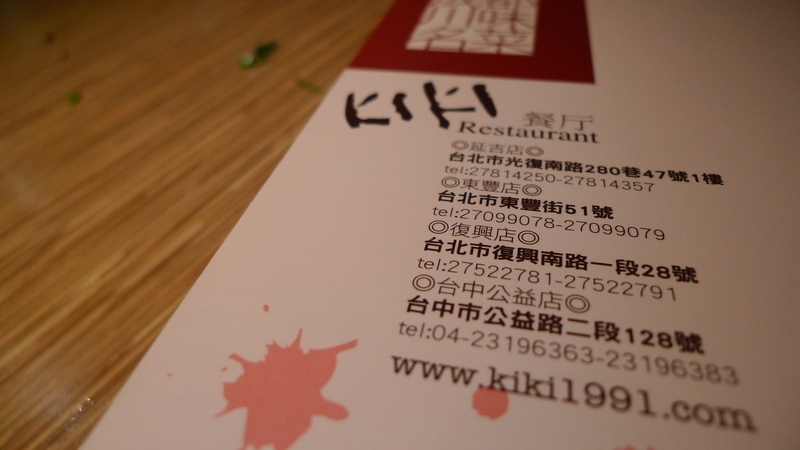 Apparently, Kiki is pretty popular, so making reservations first is a good idea. It looks like Kiki has two floors, but I didn’t go up to see if it’s actually seating; however, according to their website this location can seat 104 people so I’m pretty sure that the upstairs has additional seating. 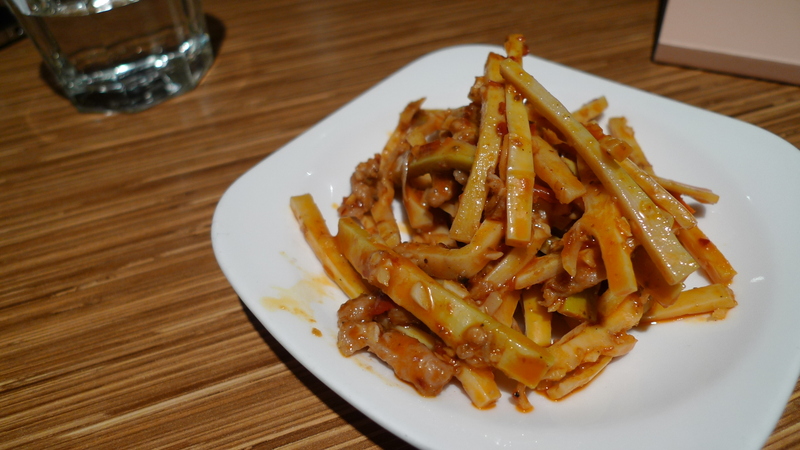 – Stir Fried Bamboo Shoots with Shredded Pork in Chef’s Special Spicy Sauce (川味竹筍) for 80NT. I love bamboo shoots so I decided to order the Stir Fried Bamboo Shoots with Shredded Pork in Chef’s Special Spicy Sauce (川味竹筍) for 80NT, which had three stars for spiciness. I though this was pretty good. The bamboo wasn’t as crispy as I would have liked, but it was still good. The “special spicy sauce” kind of just tasted like chili oil with some garlic. For three stars I didn’t think this was that spicy, but if you don’t like spicy food or are sensitive to spice I’d advise against this. 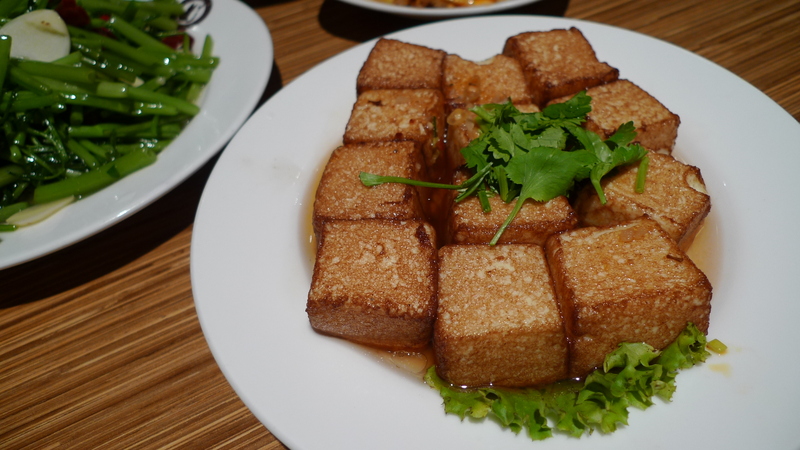 The number one thing on the House Special list is the Crispy Deep Fried Egg Tofu (老皮嫩肉) for 200NT. This dish has no spice for those who don’t like spicy foods. For a name like Crispy Deep Fried Egg Tofu this is not what I was expecting. The outside of the egg tofu was not crispy at all. The tofu was delicious though. It was super soft and almost like a custard. I can’t imagine that this is actually the most popular dish on their entire menu, but either way, it’s pretty good. 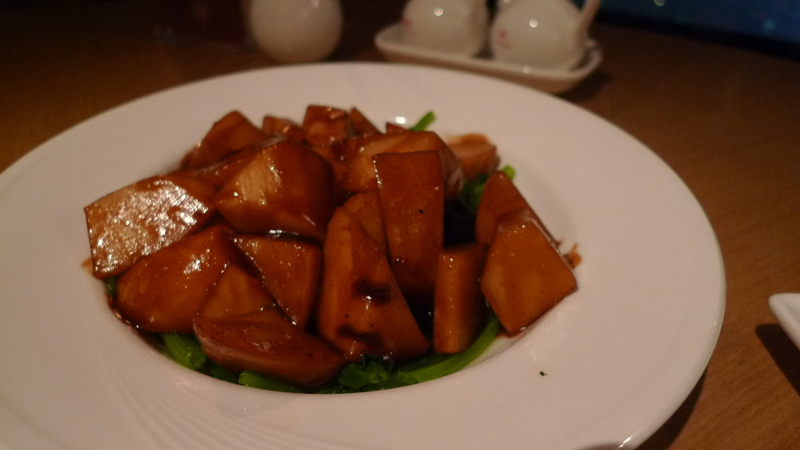 For our vegetable we went with the Stir Fried Chinese Watercress with Chili Peppers (宮保空心菜) for 150NT. The Chinese name for this dish says it’s Kung Pao Chinese Watercress, so I think I was kind of expecting something different with a sauce or something. This was better than what I thought it was going to be. 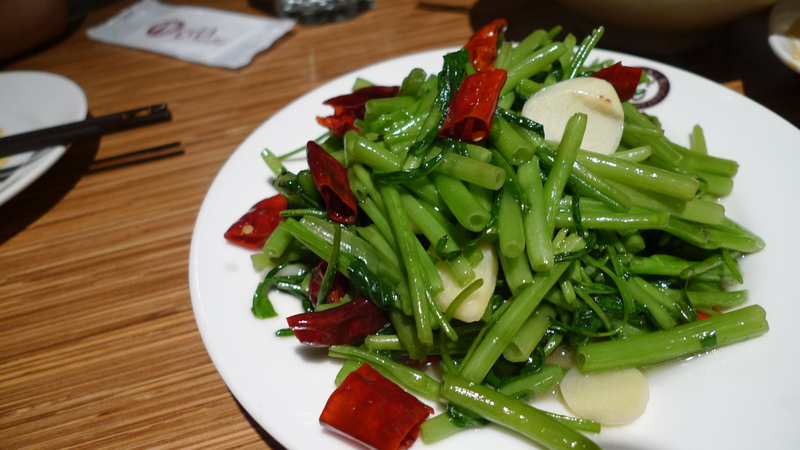 The Chinese watercress is simply stir fried with garlic, chili peppers, and salt. Simple and fresh. The menu put two stars next to this, but it wasn’t really spicy at all, just avoid the peppers. 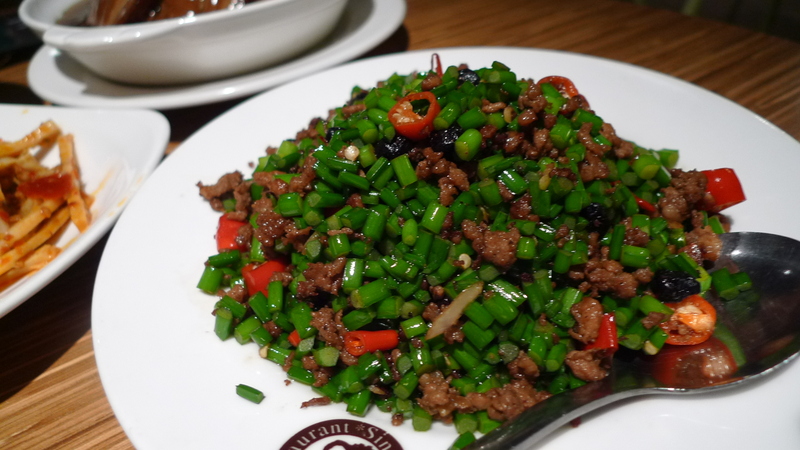 The Stir Fried Minced Pork with Chinese Chives and Fermented Black Beans (蒼蠅頭) for 220NT is the second item listed under House Specials. I like the Chinese name for this dish, literally housefly heads. Why that is the name, I don’t know. Looking around the restaurant a lot of tables had this so we figured why not. I thought this was pretty tasty. The combination of everything together was pretty good. This dish is kind of salty and would be best with rice or noodles. This dish had three stars and was probably the spiciest of the dishes we had. If you don’t eat the chilies it’s not that spicy, but if you get a chili you’ll probably be reaching for your water. The fermented black beans are pretty salty, so be warned if you get a lot of them in one bite. 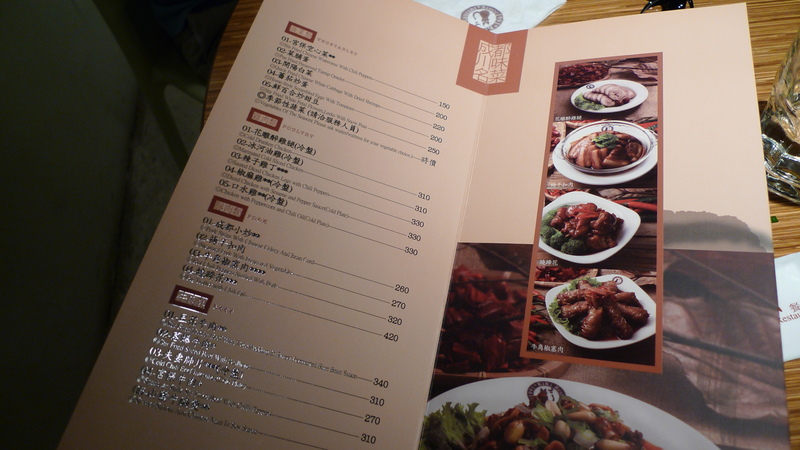 Will loves pork belly, as do I, so he really wanted to order the Steamed Pork with Preserved Vegetables (梅干扣肉) for 270NT. This dish was okay. I’ve most definitely had better pork belly (the pork belly pyramid at Shanghai Pavilion comes to mind) that was more tender and more flavorful. 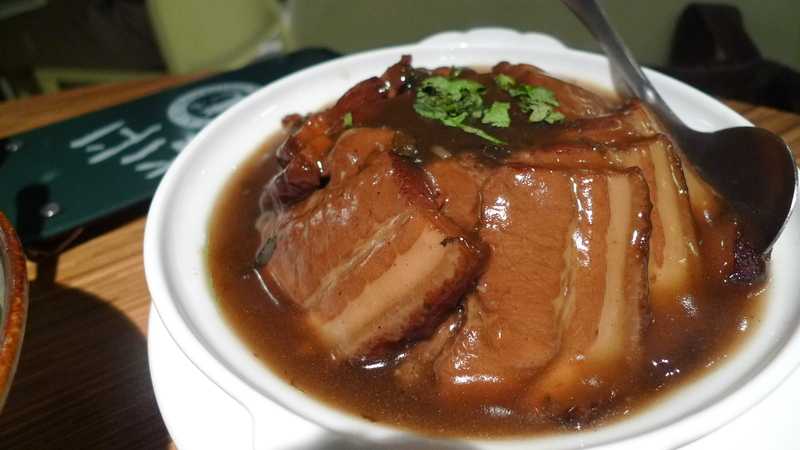 The slices of pork belly in this dish are pretty thick compared to most other pork belly dishes like this. I liked that they were thicker because there was more meat, but because it was thicker it wasn’t as tender and melt in your mouth as it could have been. The preserved vegetables under the pork was pretty good; not too salty. Will really liked the preserved vegetables. I’m not a huge rice fan so we ordered noodles instead. The server told us that one bowl could serve two people, so we figured we’d just get one and order more if we needed; we did not need to. Mike saw the word bean sprouts so we ordered the Soft Noodles Topped with Shredded Chicken and Bean Sprouts (雞油伴麵) for 80NT. When the bowl arrived Mike noticed that there was no chicken or bean sprouts, but Will and I were going by the Chinese name, literally “chicken oil noodles”, so we didn’t notice. The noodles were good, but not like it is described. I’m not sure if the English for this dish is wrong or if they forgot the chicken and bean sprouts, but either way, something was wrong. 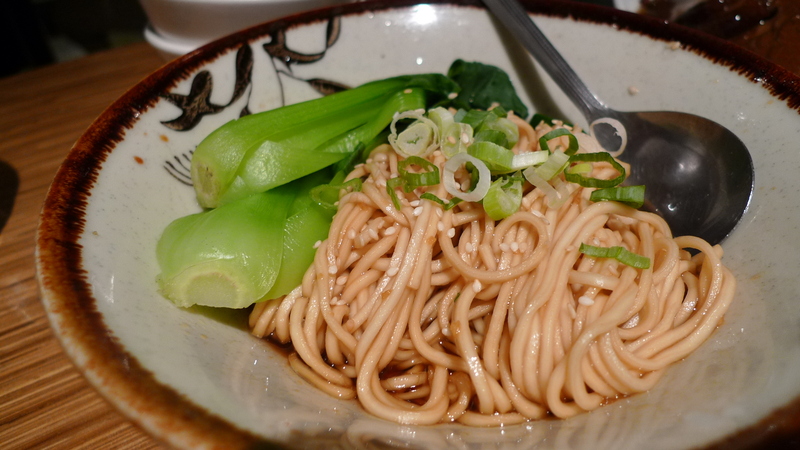 The noodles are pretty simple; good for eating with the main dishes. The sauce “chicken oil” was had just enough flavor to not make the noodles plain. Our bill came out to an even 1000NT for three people. I think that we ordered just the right amount for three people; the main dishes are not that big. I thought this place was good, but it wasn’t super spectacular. The service was not great. It was hard to get anyones attention and our waters were often empty. Also when I asked for a menu, the girl seemed really annoyed. Overall I think because of the hype I was expecting more; however, either way this place was pretty good and I would go back. Crappy weather and a failed trip to Huayuan Night Market on our first night in Tainan ended happily with a delicious meal at Shanghai Pavilion at our hotel, the Shangri-la. Never in my life had I stayed in a 5 star hotel (I highly recommend this hotel if you’re in Tainan) and it was quite the experience. Since it was raining and we were hungry we decided, let’s just eat at the hotel. Restaurants at 5 star hotels are very accommodating. We made reservations, although we didn’t need them, and were sat down immediately at a table near the window on the 38th floor. Had the super crap weather not been super crap, it would have been a beautiful view of Tainan. We decided we needed drinks. Not realizing that they did not have a full bar at the restaurant we ordered martinis. Apparently they called down to the bar on the 2nd floor, and had them sent up. Shanghai Pavilion has set courses along with a la carte options. Since we were only two people, we went a la carte and ordered the pork belly pyramid, king prawns, their special fried rice, bamboo shoots with baby shrimp, and two desserts. 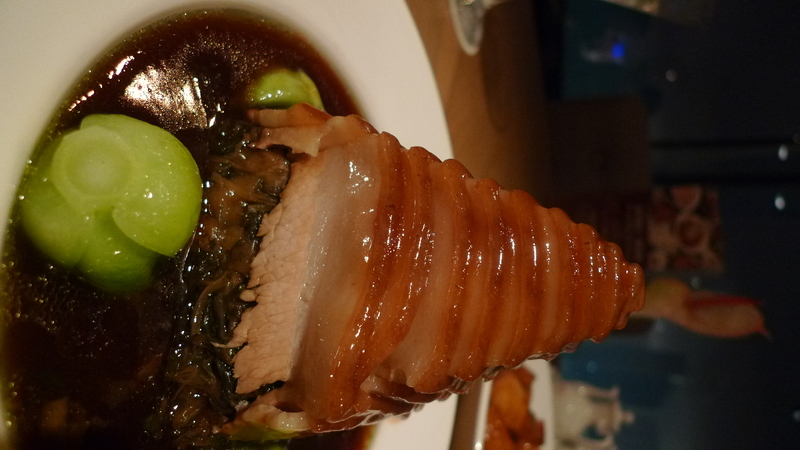 The pork belly pyramid is one of their specialties and oh my god, it was amazing; gluttony at its finest. It may be one of my favorite things I’ve ever eaten. The pork belly was tender, juicy, flavorful and delicious. We were trying to figure out how it was holding it’s form and found that underneath were pickled vegetables. The vegetables were the perfect match for the pork belly. The flavors matched perfectly, and the vegetables helped to cut the fat from the pork belly. The best bite was a little bit of everything: pork belly, pickled vegetables, slathered in sauce. Surprisingly this dish was not too salty. With the pork belly, pickled vegetables and brown sauce, it looks like it’d be too salty. While this dish was rich, it was not too salty. In fact, it was pretty balanced, to me at least. Simply amazing. 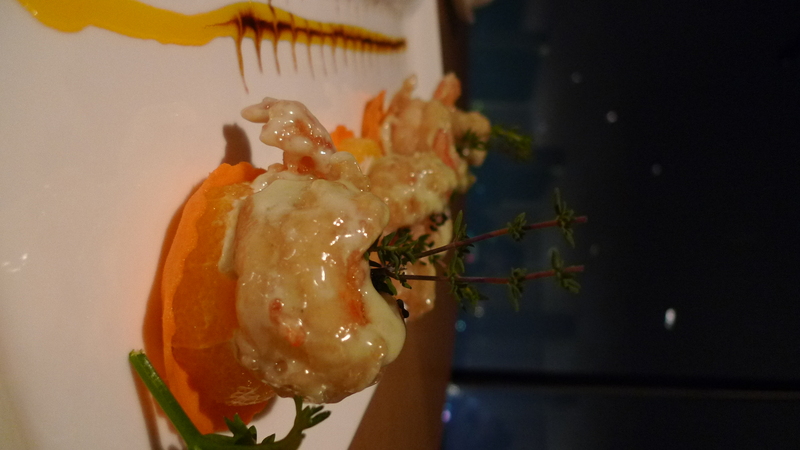 The king prawns were another one of their specialty dishes. The dish comes with four king prawns, each lightly battered and flash fried, slathered in a creamy citrus sauce, served on a slice of carrot and orange. This too was delicious. All together the flavors worked together. I loved all the citrus and the slightly crisp outside of the prawn. The prawn was meaty and cooked perfectly. Again, like the pork belly, the best bite was when you got a little of everything. Our vegetable for the night was bamboo shoot. I love bamboo shoots and these were great. Crispy and juicy, just the way they should be. The sauce tasted like a generic brown sauce, salty and sweet, neither too overpowering. It said that there were baby shrimps, but I don’t remember seeing any. Doesn’t really matter because we wanted the bamboo shoot. There were some leafy greens under the bamboo which were good as well. We decided we needed either rice or noodles, so we got their specialty fried rice. When I asked what made it different she said it was dryer than most fried rices. Inside was green onions, meat, egg, and maybe some other stuff we couldn’t make out. Either way, this rice was great. Even though it looks like it would be salty, it wasn’t. In fact, it was perfect for our other dishes. 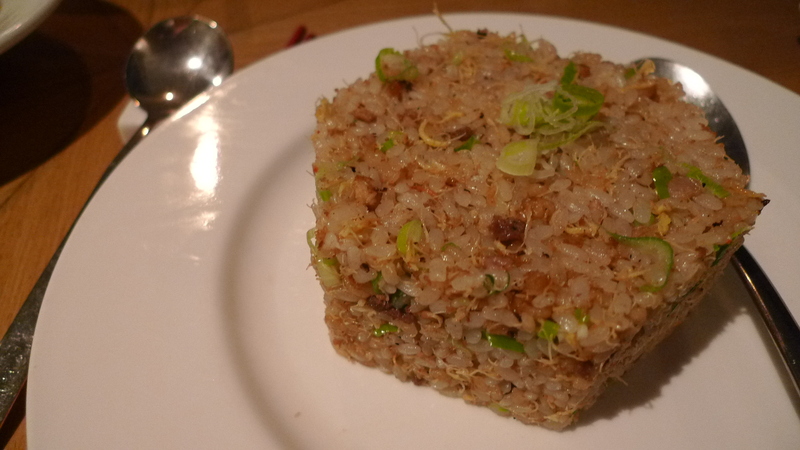 I like the “dryness” of the rice. It had a good texture and the flavors were great. For dessert we didn’t want to go too sweet, so the waitress suggested these cute little pumpkins. 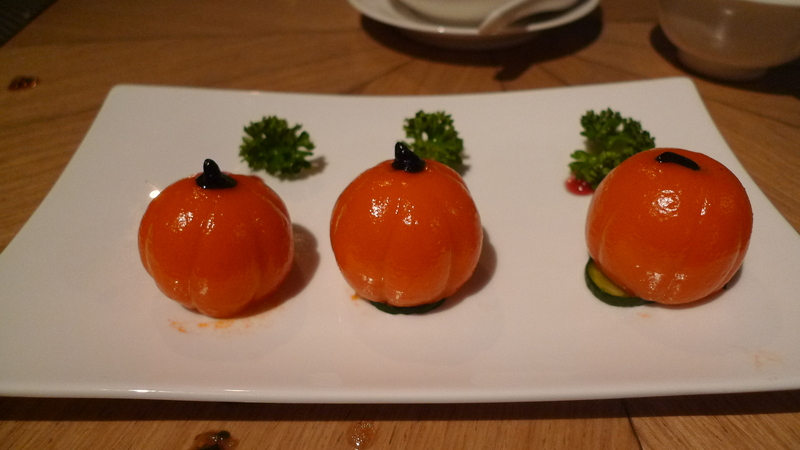 The outside was like mochi, there was no pumpkin flavoring, it was made to look like them. The date paste inside was the perfect sweetness for us, since we weren’t look for anything very sweet. I decided I also wanted to try the mango sago. It was sweeter than the pumpkins, but it was not too sweet. 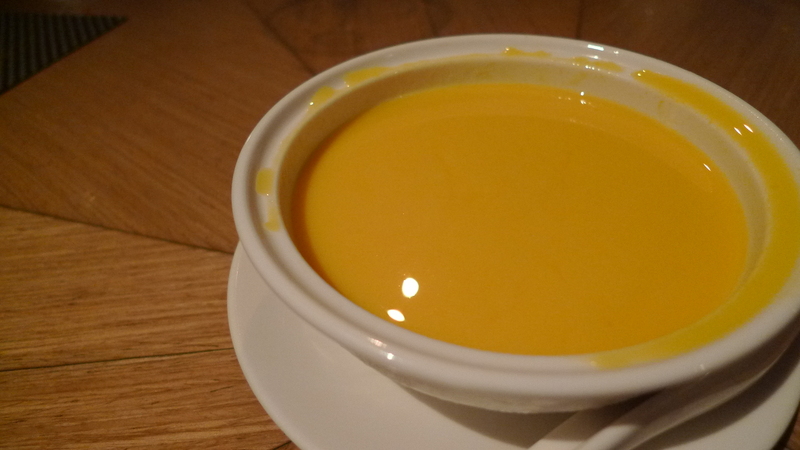 The mango “soup” was great. It tasted like freshly pureed mangos and cream. The sago inside was good too, nothing special, but overall this was a tasty dessert. Everything about Shanghai pavilion was great: the food, the service, and the view. I want to go back and eat multiple pork belly pyramids, but I won’t because I’d probably clog too many arteries. So instead I will go back and eat one pyramid, and honestly, I’d re-order everything we got.